Welcome back to another round of The Best Box Break Hits of the Week from the DACW Live Lounge and our team of breakers. Our breaks are streamed live through Twitch, Breakers.TV, and YouTube, encouraging participants to interact during the break and are always a fun time; when a great card gets pulled, we can’t help but get excited ourselves! That’s the beauty of box breaks – you never know what you’ll get and you can’t help but feel a little adrenaline rush every time there’s a pull. Follow along here on the blog as we will be recapping and showcasing some of the best pulls each week. 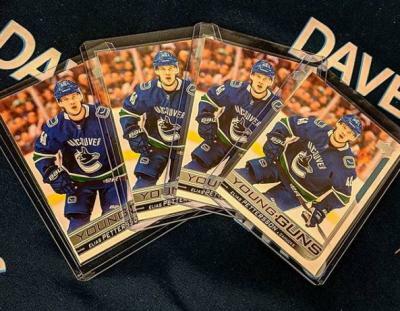 We have a quartet of #DACWPulls of Vancouver Canucks rookie Elias Pettersson’s Young Guns card from 2018/19 Upper Deck Series One Hockey! Pettersson has dominated the Calder Trophy discussion over the first month in a half of the season as he leads all rookies in scoring. Pettersson was drafted fifth overall at the 2017 NHL Entry Draft in Chicago out of Sweden and regular readers of the blog over the years know all about Vancouver and their history with Swedish players (cough cough the Sedin twins)! The 2018/19 season is shaping up to be quite memorable and the strong rookie class has a lot to do with that! If you want to get in on the action (and you know you do!) check out our box break schedule for more information on upcoming breaks. We have a huge couple of weeks coming up with the holidays as there are a plethora of breaks along with special additional prizes to be had (over $1,500 worth)! If you are new to breaking and have some questions still just head over to our box break FAQ for answers to pretty much anything! Have you had any great pulls from one of our breaks or one of your own? Share your story in the comments below or post on social media (Facebook, Twitter, Instagram) using the hashtag #DACWPulls! The post DACW Live – The Best Box Break Hits of the Week 11/19 – 11/25 appeared first on Dave & Adam's News.